I love this post title, but I have a confession to make: I don't have much at all in the way of an exciting, dramatic story to back it up. Because the conclusion of that sentence is the very boring "...by laying low." And I feel really disappointed in Halloween this year, mostly in myself. We didn't go out into the world this year, not even for 10 minutes. We stayed home. Now, when I say "stayed home" I mean we went to the fabulous party our big kid-filled apartment building throws in the lobby every year. 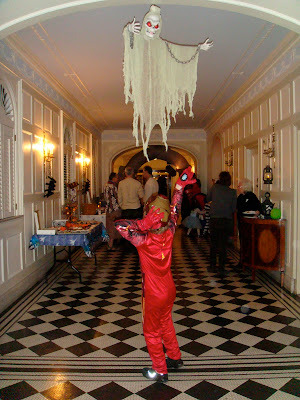 And the kids trick-or-treated inside the building in full regalia, and a friend with her twins joined us. Ethan went to the upstairs neighbors apartment in the afternoon to help them decorate their back door landing (where the trick-or-treaters come for candy). And we did step outside. We stood right in front of our building for two minutes so I could take pictures. But Ethan was, shall we say, less than thrilled as he was anxious to get back inside; champing at the bit to get the trick-or-treating candy acquisition process started. Jake on the other hand? Really getting into character. Maybe a little bit TOO into character. But really, THIS year? This was kind of lame. Because this year Halloween fell on a Sunday. That meant the city in general, and our kid-filled, kid-oriented, kid-friendly Upper West Side neighborhood in particular was Halloween-crazy and it would have been a blast to go out with the kids up to Broadway where all the stores were giving out candy and the sidewalks looked like a chaotically organized Halloween parade. 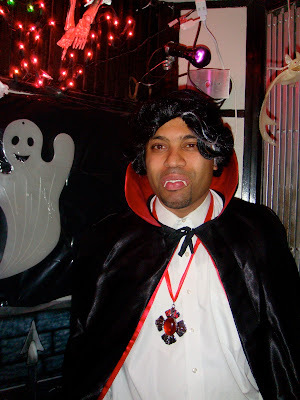 If you want to get a sense of how fabulous Halloween on the Upper West Side in NYC can be? Read my friend Sandra's post about it here. She and her family did it up righteous proper this year, her first in New York City. 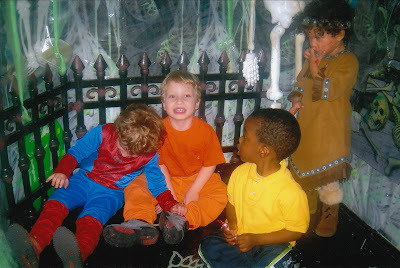 In past years we have always joined in the Halloween party at Riverside Park's Hippo Playground. It begins with a procession down the hill from the Soldiers and Sailors Monument into the park, lead by bagpipes. 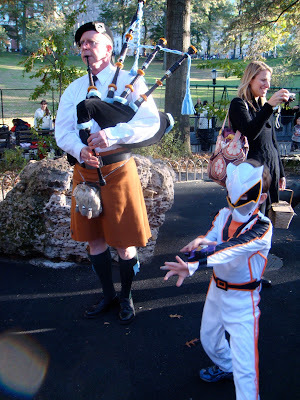 Then inside the playground there is more bagpiping and free donuts and cider. 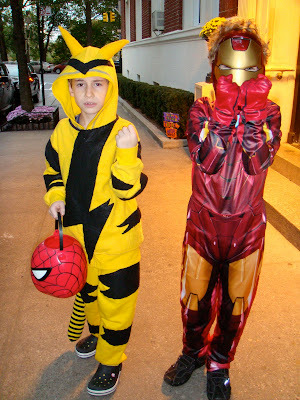 We had planned to go out and about in the city as a family; trick-or-treat on Broadway, visit some or those fabulous, famous, blocked-off Halloween Block Party blocks, maybe meet up with some friends. But my husband wasn't feeling well, and is not a crowd person on his best days. And I just couldn't face managing an over-excited Jacob and the Ethan/Jacob dynamic in a crazy crowded scene alone. Other times I might have been game, but this year, right now? I am just managing to stay afloat on ordinary days, so no, I took a pass on that one. Also? 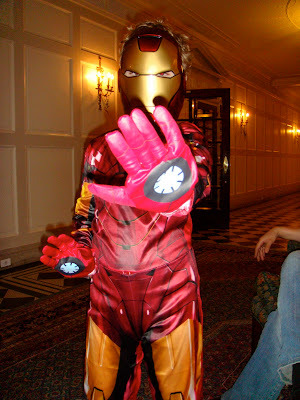 Ethan's home made costume was MUCH more time consuming to make than I had counted on, and I was still finishing and finishing, and finishing, and finishing until rather late in the day (and I never did get to the last finishing touch, sewing the little round antenna things on). But he was very pleased with the results, so I think it was well worth the effort. At least our building does host a lovely party. It helps that it is full of family-size apartments and actual families with lots and lots of kids of all ages. I remember when our kids were the youngest, newest members of the gang, and now they're firmly in the middle of the pack. 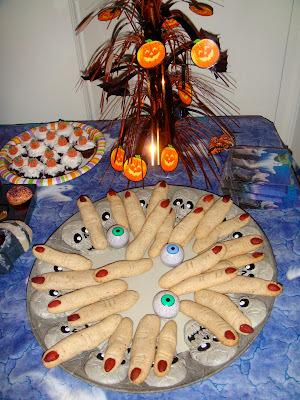 gives new meaning to the term "finger food"
Now imagine without the flash, with only a spooky black light on in the elevator... Like I said, our building? 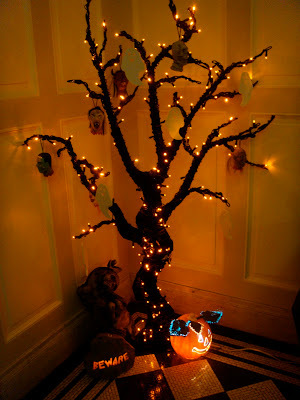 Halloweenly Awesome. So I kept thinking: "We'll do the big hullabaloo next year." But then, only after it was all over, I realized that next year Halloween will fall on a Monday, a regular work day. And while there will be merriment, it won't be an all day affair, it won't be that magic Halloween weekend thing. Not for another five years. And in 2015? 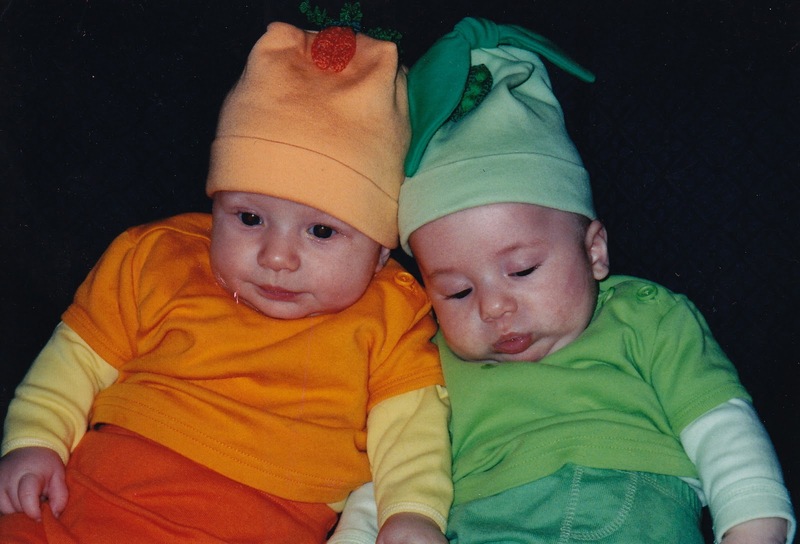 The boys will be 13. They will have been (god willing) Bar Mitzvahed already. Too old to be swept up in the kiddie magic of Halloween. Likely to be too cool to play the fool. But you never know. It could happen. Since a good time was had by all, I'm probably being too hard on myself. I should just chillax. A Twix Bar stolen from Ethan's candy bucket should do the trick... now where did I hide that thing? 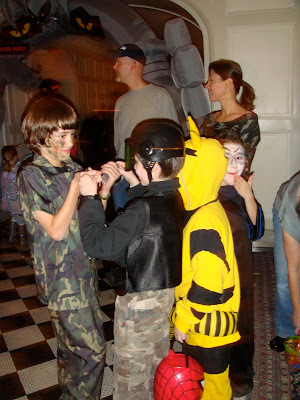 you can find something awesomely amazing to do with them at any age at halloween its never goes away it just gets more "adult" still lots of fun though! I love that your building has a Halloween party in the lobby! That is the way it should be! We live in a condo community with shockingly few families with children. There is no trick or treating because the buildings are all locked. I think that is criminal! My kids would have done anything for a party like this. It was freezing here in Massachusetts, and my youngest lasted 5 minutes and my oldest 20mins (and home in tears). The up side? Not a lot of candy for me to pilfer. WOW! That is some building! And neighborhood! But what really impresses me? Homemade costume?!! Are you kidding me?! 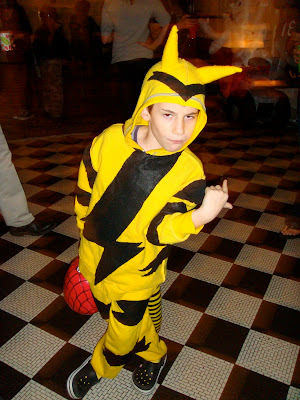 I'm lucky to order my kid's costume in time! Showing me up again, girl. Totally jealous of your apartment building, and your ability to make costumes. 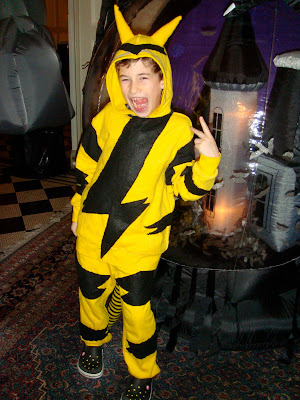 I cheated with a bought costume for Pudding we've owned for two years, and a hand-me-down for Cubby. It was enough just to restrain her giddy spirits!